Ahoy mateys! If you are like me and have a young pirate in your family, there are several experiences you don't want to miss on your Walt Disney World vacation. 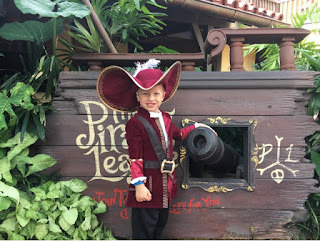 Today, I'm going to highlight a magical adventure for junior buccaneers - The Pirates League. The Pirates League is located inside of the Magic Kingdom by the Pirates of the Caribbean ride in Adventureland. There are experiences here for kids and adults, boys and girls. 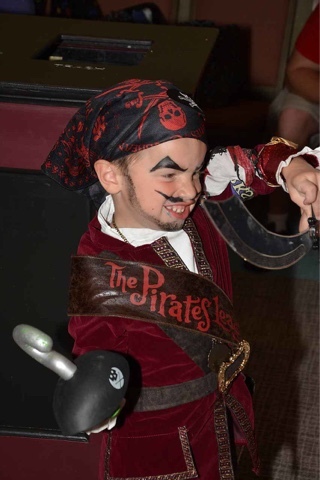 Packages include the chance for pirate makeovers and mermaid makeovers. 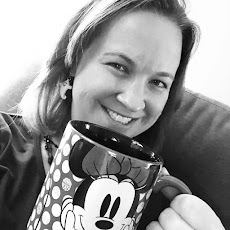 Similar to the more well known Bibbidi Bobbidi Boutique, guests can choose to participate in just the makeover or purchase costume options as well to complete the look. We made a reservation for 9:40 AM following a breakfast at The Crystal Palace. We chose to make an earlier reservation so that we could get the most bang for our buck. Brody also had a Captain Hook Halloween costume that we had bought on sale from The Disney Store. We arrived at The Pirates League right on schedule, dressed and ready to go. Upon checking in, Brody was presented with a menu of makeover options and he decided to go for the Captain Hook option. I was prepared for the $49 price tag and was expecting a well-executed makeover. The experience was so much more though!! When the young pirate or mermaid first enters, he or she is assigned a new name. You then wait your turn in the "salon" where you can watch everyone else getting their makeover and celebrate their transformation. When it was Brody's turn, he was invited to join a cast member in his own special pirate chair. The cast member was entertaining and asked Brody all kinds of questions about his pirate adventures. 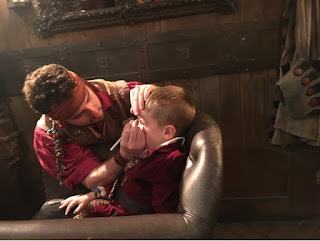 During the makeover, Brody was presented with a bandana, eye patch, earring, and necklace with a pirate medallion. When he was finished, Pirate Matthew Ironeagle (the name that was selected for him at the beginning), was presented to the room. He was given his sash and sword and then had to swear a pirate oath. The final step in the experience involved a secret trip into the treasure room. I don't want to spoil the surprise - but it is certainly a fun, entertaining way to end the visit. The last step is to of course pay for your trip to The Pirates League. In my opinion, this is well worth the money. It was one of Brody's favorite things we did on this trip and I think he'll remember his visit for a long time to come. 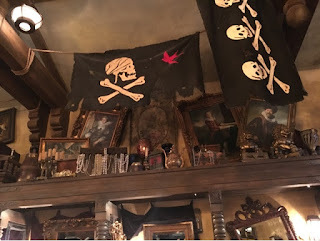 We followed up our visit to The Pirates League with a sailing on the Pirate and Pals Fireworks Cruise that night - a topic for another post!